I wish you all a happy new year and hope you started of great! Thank you, for visiting my blog this year. The first recipe of the year is dedicated to cleaning up the pantry: using up the left overs from Christmas to be precise. Chocolate (I mean all of you Santa Clauses out there) and Spekulatius all mixed into a cake. In case you were wondering what Spekulatius is: it is a type of spiced Christmas cookie in Germany with lots of cinnamon, clove and cardamon. In my opinion the cake tastes wonderfully of winter and not just like Christmas. Perfect for using up a few leftovers and cuddling up with a cup of tea. The beautiful coat on the mini bundt cakes in the picture is my favorite chocolate coating, which I already posted on the blog. But the cake also tastes great without a coating or just drizzled with chocolate. Preheat the oven to 330° F (165° C, Upper- and Lowe heat). Prepare a bundt cake baking form. Melt 100 g of chocolate and set aside. Smash up 200 g of Spekulatius in a mixer or in a freezer bag using a rolling pin. Beat 250 g of soft butter, 50 g sugar, 1 tsp vanilla extract and a pinch of salt until creamy..
One after the other add 4 eggs and beat until incorporated into the butter. Afterwards add 300 g flour, 7 baking powder, 3 tbsp cocoa, 1 pinch of cinnamon, 150 ml milk and 100 ml yogurt and mix well. Now stir in the molten chocolate and Spekulatius bits. Add the dough to the cake form and bake at 330° F (165° C, Upper- and lower heat) for 60 minutes until a skewer inserted into the cake comes out clean. After the cake has cooled completely remove it from the pan and dust with powdered sugar or coat in chocolate. Keeps well covered up to a week outside the fridge. Coating the cake in chocolate will prevent it from drying out too quickly. 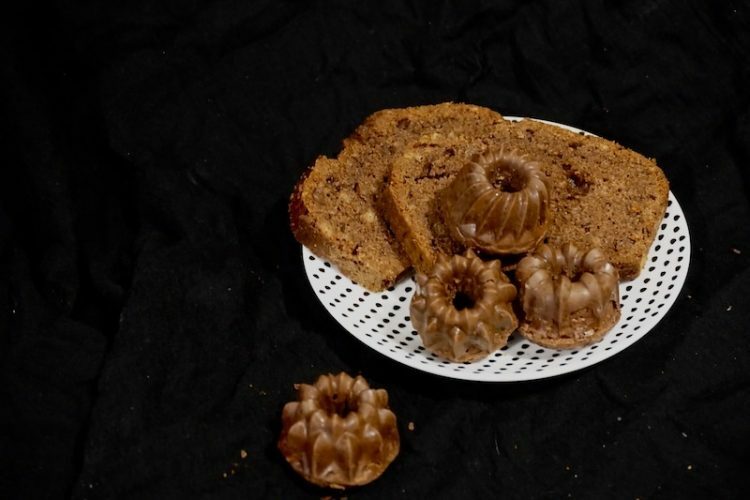 The miniature bundt cakes were baked at the same temperature for 20 minutes. © 2019 foodistini. All rights reserved.